The Team Sky rider wrote in Le Monde newspaper, ironically the same publication that first revealed he had returned an abnormal result in a doping test in September. Froome at last night's team presentation. TOUR DE FRANCE favourite Chris Froome insisted he would never cheat to win cycling’s biggest race, writing in the Le Monde newspaper that victory based on a lie would be a personal defeat. On the eve of the start of the Tour, the British rider who was jeered when he was presented to French cycling fans on Thursday, said he was relieved that cycling authorities this week ended a probe into doping suspicions surrounding the four-times winner. “Winning any race by lying would for me be a personal defeat,” Froome, 33, wrote in the French newspaper that first revealed he had returned an abnormal result in a doping test during the Tour of Spain in September. Froome said that he had been cleared of wrongdoing “after nine months of meticulous analysis” of the so-called adverse analytical finding (AAF). He insisted that the AAF was not the same as a positive doping result and should have remained confidential. Instead, the abnormal result was leaked and has clouded preparations for the Tour de France, with organisers taking the unusual step of banning Froome from taking part before relenting after cycling’s world governing body, the Union Cycliste Internationale, announced he had been cleared on Monday. But on Thursday, when Froome and his Team Sky took part in the traditional presentation of riders to the public at La Roche-sur-Yon, the starting point of the tour, the race favourite was whistled and jeered by some cycling fans in the crowd. “Preparations for this race have not been all that smooth. Whether that is for me, for the organisers, and for you, all the cycling fans and the French, that is all who represent the real heart of the Tour de France”, he wrote. He said that it was “normal” that questions were raised about abnormal test results for asthma medication Salbutamol, which he said had been necessary to treat his chronic condition since childhood. But he insisted French fans should have confidence in the fact that he would never cheat. “I was fully sincere when I said on the podium on the Champs-Elysees that I would never dishonour the yellow jersey, and my results will stand the test of time,” he added. Email “I would never cheat to win Tour de France, writes Chris Froome in open letter ”. 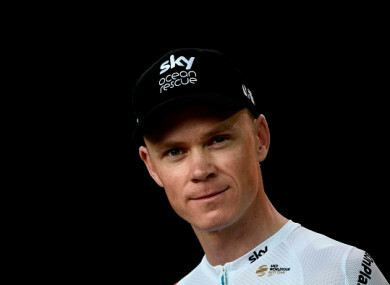 Feedback on “I would never cheat to win Tour de France, writes Chris Froome in open letter ”.